Great around town. Folding fabric roof can be operated at any speed. Easy to drive. No rear seats. Expensive next to coupe. Limited boot access. Poor ride quality. 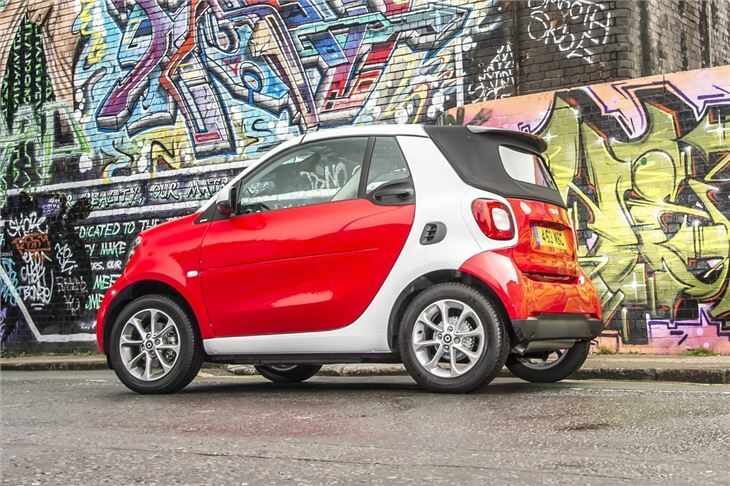 With its cute styling, compact size and easy to drive nature, the Smart Fortwo Cabrio is great for nipping around town in the sun. However, its folding fabric roof does mean some compromises. 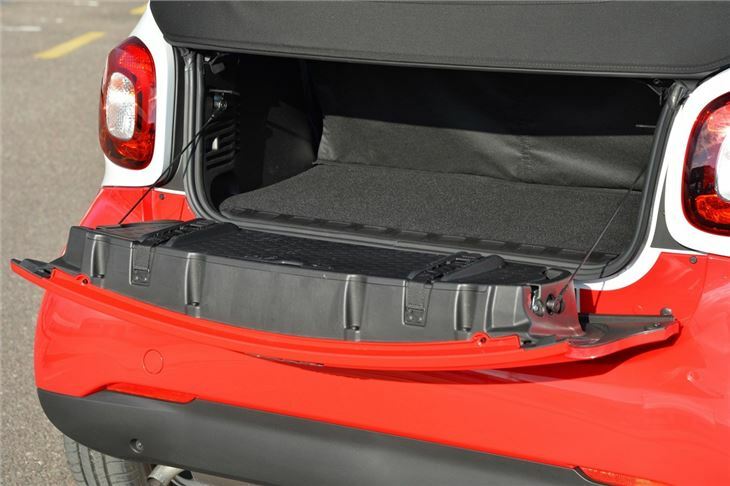 The back window is prone to getting dirty quickly since it has no rear wiper and while the boot is the same size as in the hard-top, access is tighter in the Cabrio. 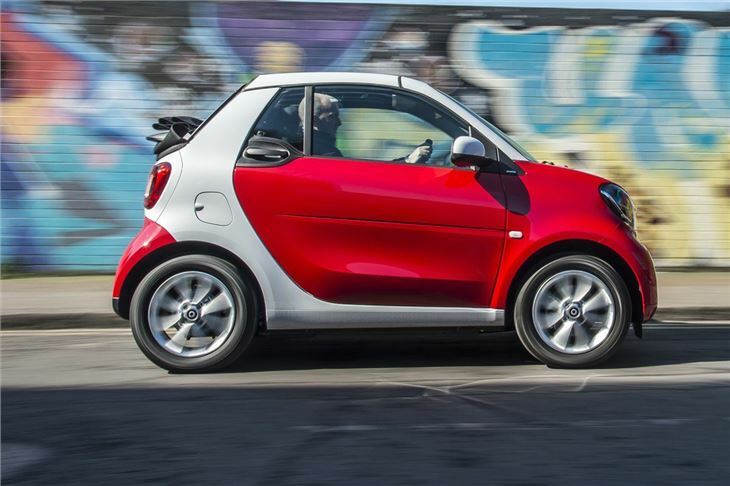 Oh, and it's more expensive than the Fortwo coupe, too. The roof can be retracted while on the move and set to any position – so it can be treated like a sunroof or taken all the way back. If you know it’s going to be nice and sunny with no chance of rain, you can go one step further and remove the bars from above both doors, storing them in a special pocket in the tailgate. 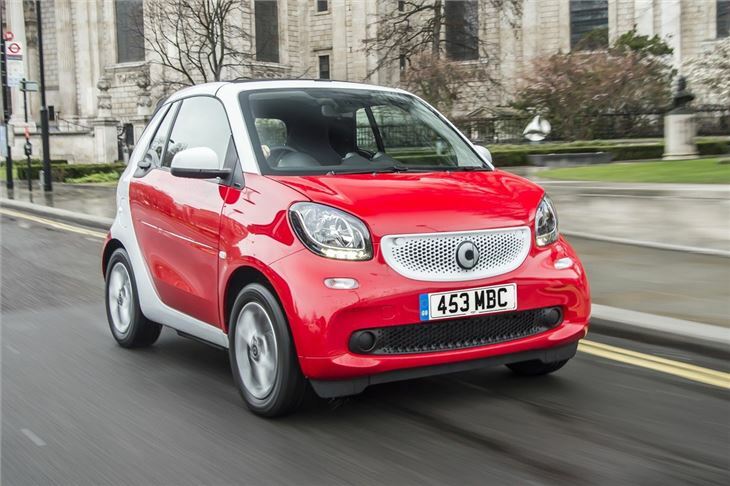 On the move the Fortwo Cabrio is extremely easy to drive, with very light controls and a tight turning circle. U-turns in busy streets, parallel parking and tight gaps in traffic are made almost effortless. Both the 71PS and 90PS engines are perky and responsive and they work well with either the manual transmission or the smooth dual-clutch auto, which is a great choice for stop start urban driving. 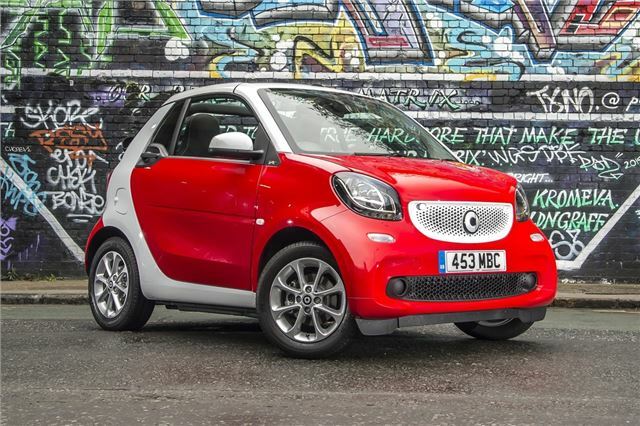 But the Fortwo Cabrio clatters over speed bumps and feels a bit wobbly and jittery on uneven tarmac. It’s loud on the motorway too – though it can hold its own when it comes to overtaking and keeping up with high-speed traffic. The problems don’t stop there – the Fortwo Cabrio costs a lot more than the hard-top version and is similar in price to the Fiat 500C, which is more practical. 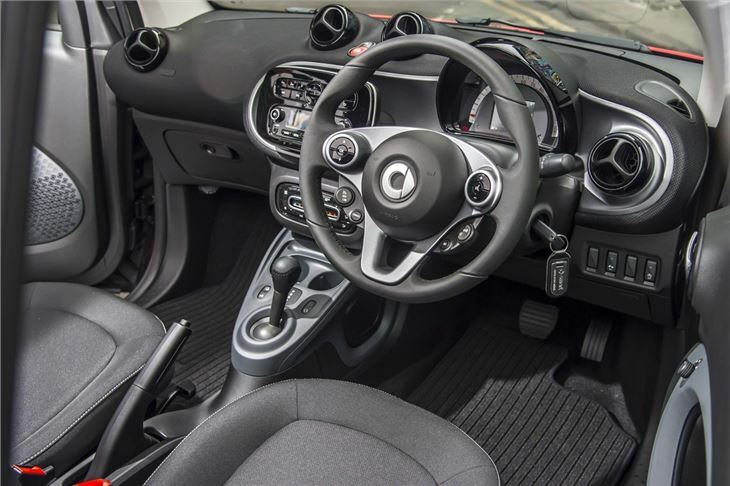 That said, any Fortwo buyer knows the limitations before they buy and, while there may only be two seats, there is a surprising amount of space in the cabin. Tall drivers and passengers shouldn’t have much trouble with head or legroom and there is enough storage for the usual odds and ends, like coffee cups, smartphones, dash cameras and maps, to be stored neatly. 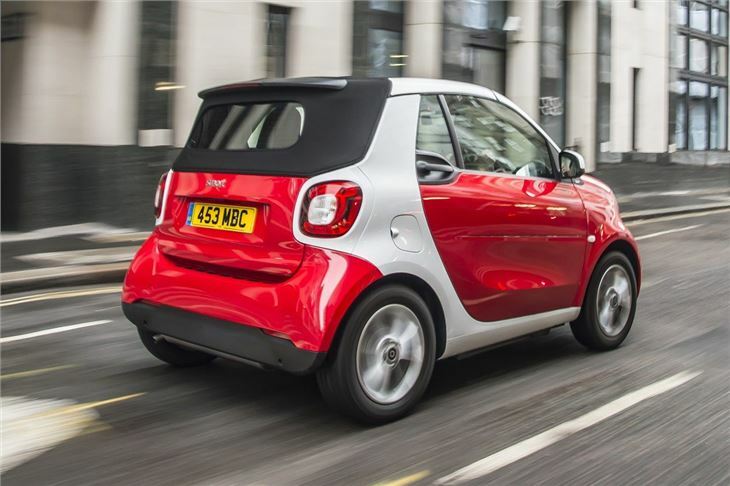 The lack of rear seats, a small boot and surprisingly high pricing mean the Cabrio will hold limited appeal for the average urban motorist. But many buyers will fall in love with the quirkiness of the Fortwo Cabrio, and will be willing to pay the extra for it. If that’s the case with you then you’re unlikely to be disappointed - it’s great in town, easy to drive and packed with character.